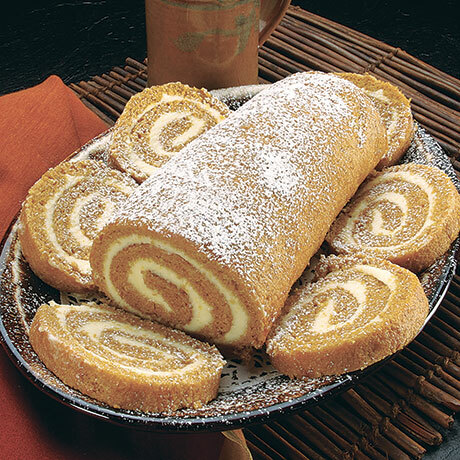 A rich and moist pumpkin roll swirled with a luscious butter cream filling. 8-inch, 18-ounce roll. Sugar, margarine [palm oil, water, soybean oil, salt, natural flavor (milk), soy lecithin, beta carotene (color), vitamin A, palmitate], eggs, wheat flour, invert sugar, water, soybean oil, cream filling [water, sugar, modified food starch, palm oil, salt, glucono delta lactone, titanium dioxide, methylhydroxypropylcellulose,potassium sorbate and potassium benzoate (preservatives), natural and artificial flavors, FD&C yellow 5 & 6], soybean oil, natural flavors, corn starch, dehydrated pumpkin [pumpkin, maltodextrin, corn flour, lecithin], fruit juice (grape, apple, pear), natural grain dextrin, glycerin, guar & xanthan gums, spices [cinnamon, ginger, clove], salt, cellulose fiber, eggs (dried), propylene glycol, baking powder [sodium acid pyrophosphate, sodium bicarbonate, corn starch, monocalcium phosphate], modified corn starch, baking soda, wheat gluten, caramel color, locust bean gum, canola oil, potassium sorbate (preservative), artificial color [water, glycerin, FD&C yellow 5 & 6 and red 3 & 40, sodium benzoate (presevative)], oat fiber, soy protein isolate, sunflower/safflower oil, soy lecithin, gum acacia.